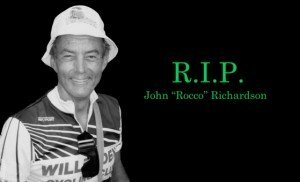 On Sunday, 5 August, there will be a ride in honour of John Rocco Richardson. Rocco would have been 76 on this day. The ride will start at the cafe at Manor Farm, Ruislip, at 10am, and head out to Jenner’s at Boulters Lock – and back. This will be a distance of 76km. Arrangements have been made for the cafe to open early. All members and friends of Rocco are warmly invited to join this ride. There are also plans to run some Audax events in memory of Rocco. Further details will be made available. Fantastic I will be there, so pleased to take part in something for a nice guy and a good friend. I miss not hearing that voice you could not mistake in a crowd.